This was an easy challenge for me....I use ribbons and pearls on most of my cards! Don't you just love this image?! I think it's just perfect for a Get Well card. For the past few weeks I've felt very much like this poor bear! I spent the week of February school vacation in bed coughing and sneezing, hacking and wheezing! I'm just now starting to feel human again! This card gave me fits while I was making it! The robe is paper-pieced, and when gluing it, I got glue on the card stock which made it necessary to cut out the image. I then had the bright idea to cut out the sentiment, too! It was a real pain, but I really think that the botch-up turned into a really cute card. The flowers were made with leftovers from other projects. 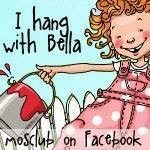 I hope you'll join us this week in Mo's Challenge! You just might win a $5.00 gift certificate to Mo's Digital Pencil! Well glad you're feeling well enough to create this adorable card. He is so cute, love the paper piecing of his robe. I really like the sickie bears too and you have used some great colors on the card. The fussy cut sentiment is so effective. Love it Elaine! Elaine, sorry you were like the sickly bear but she sure is cute and you colored her beautifully. Love the cut out sentiment. Perfect. Absolutely snuggly gorgeous Elaine. Love this ! Yeas, I think so too, this would make a perfect get well card; the image, the colors you always know to blend them so beautifully! Oh yes, I do love this image and of course I love your card, Elaine! 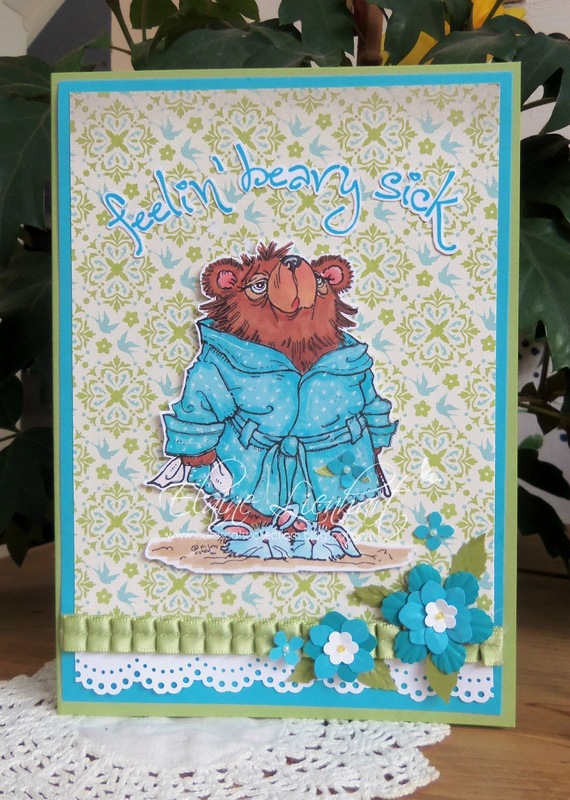 The bear is really feeling blue, but she makes your card look so gorgeous and funny - best way to get better soon!